Another bullish strategy is the call backspread a.k.a reverse call ratio spread. 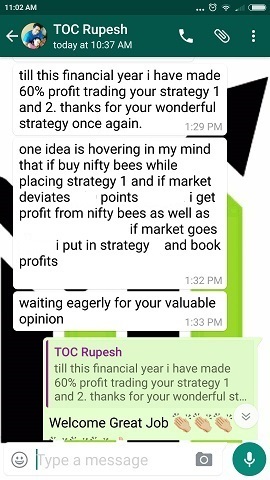 This strategy has unlimited profits with limited loss. As again and I have told this many times in my blog that unlimited profits or unlimited losses are only on paper. You can always take a stop loss or hedge your position. Call backspread or reverse call ratio spread is good strategy for a volatile market when a stock moves in any direction. But you profit more if it moves up. If it falls you keep the premium received. In a call backspread the trader will sell one ITM (in the money) call and buy double or more number of OTM (out of the money calls). Some people say you should only buy double the number of call options sold, but the fact is you should buy more calls than the number of calls sold and this depends on what is your view of the market. If you are absolutely sure markets will move up – buy more than double the number of calls. But on the other side it will increase risk because the premium received will be less than the money needed to buy calls. In that case if the stock falls, you may suffer losses. Now this “more” depends on how much you are willing to risk. Ok let me explain in details. Let us suppose Nifty is at 5500 and you are bullish. You can sell one ITM call and buy two OTM calls. Sell one lot of 5400 call @ 200. Buy two lots of 5700 call @ 50. Total amount credited: 10,000.00 – 5,000.00 = Rs. 5,000.00 credit to the traders account. 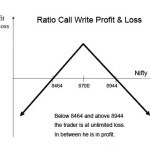 Note that the trader to reduce risk can always buy calls with lower strikes, for example 5600 call. But then the credit they receive will also get smaller. If they come even close letâ€™s say buy the 5600 call, the risk gets even less, but then the account gets debited (not credited) and if Nifty does not move much or even closes lower, the trader losses money. So ideally you should go that far to buy calls that make sense. Same is the case with selling calls. You got to be sure that the premium you receive is something you are comfortable with. Selling OTM calls and buying deep OTM calls will be useless. The premium you receive is also important. There is another twist to this strategy. 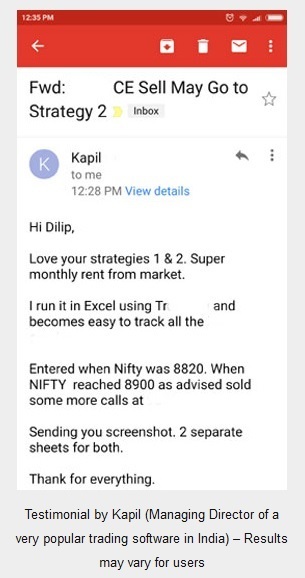 If you do this with really very deep in the money calls and get a good premium, you would want Nifty to fall and expire somewhere near the strike price of the sold call – because in that case you will be happy to keep the premium. This is in total contrast to what this strategy stands for – a bullish strategy. But then why people don’t trade this with deep in the money calls? Because the losses can be heavy if Nifty expires somewhere in between the bought call strike price and the sold call strike price. The trader in that case loses the money they used to buy the ITM calls and also may suffer losses in the sold call. That’s a worst case situation and as you know, no one can predict Nifty movements. You must be thinking why the trader will lose money in both the call sold and the one bought. Ok letâ€™s look at the results to clear this confusion. Loss from the 5400 call sold @ 200: 5700-5400 = 300. (200-300) * 50 = -5000. Loss from 5700 call bought @ 50: 5700 calls expires worthless. Money the trader used to buy these calls is now 0. A loss of 50 * 50 * 2 = -5000. Total loss = -5000 + -5000 = Rs. -10,000.00. I hope now the confusion is cleared. The trader losses money in both the sold calls and the bought ones. However the good news is that this is the maximum he will lose. The trader cannot lose more than that. Tip: Whenever you trade options you should have a bail out point. Even before you start trading you should know what’s the Max loss you will take in the trade. Once it is reached just exit the trade and do not look back. Move to next trade. Trading is all about risk management, not about making money. If you are trading to make money eventually you will lose. Loss from 5700 call bought @ 50: 5700 calls expires worthless. Money the trader used to buy these calls is now 0. A loss of 50 * 50 * 2 = -5,000.00. 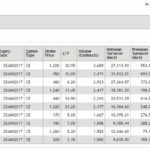 Total Profit: 10,000.00 – 5,000.00 = Rs. 5,000.00. Note that Call BackSpread is an unlimited profit strategy. If Nifty closed at 6100 profits would have increased. As you can see from the above the trader suffers losses only if Nifty expires anywhere near the strike price of the calls bought. Now my question is will a trader actually wait till the expiry? He will have a target in mind. 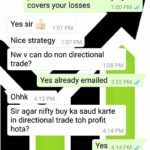 If he is making a profit he should close the position and exit or if his stop loss is hit, again close the position. It is never a good idea to wait until expiry for any option bought or sold. 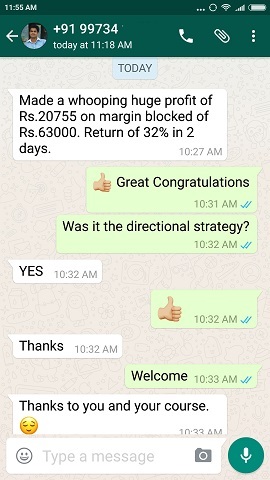 I have given the results as per the expiry because it is very difficult to know exactly what prices the options will be when they have not expired as it depends a lot on volatility, time and other factors. It will not be fair on my part to assume the prices and explain the results. What happens if a trader buys the same number of lots and sells the same number of lots? In that case it becomes a call credit spread (and not call backspread) strategy in which a trader wants the indices to stay below the strike price of the calls sold. If the stock or the index moves north, the trader loses money. But in the backspread they make money if the index moves north. So which one is a better strategy? 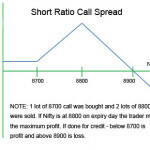 The call credit spread or the call backspread. It depends on the situation. If you think there is big news coming and Nifty may move up, but the lack of news or negative news may take it down – you should implement the call backspread strategy. Another Tip: Once the news is in and your view was right and Nifty starts to move up, you can buy more ATM or slightly OTM calls up to a level of risk you can take. But if the opposite happens, just convert it to a call credit spread by selling more ITM calls. You can go for a call credit spread when you are sure index will not move up – i.e. stay where it is or move south. If you have any confusion you can ask in the comments section. 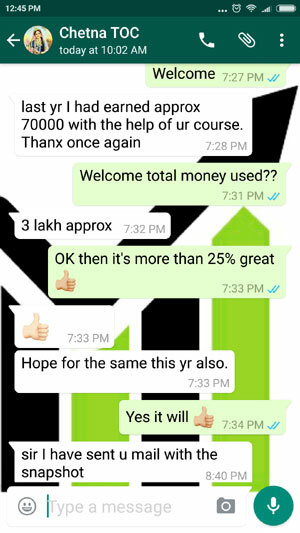 Educating yourself on options trading is the best decision you can take. Stock trading is a business as any other business and you should educate yourself before doing real trading. If you want to buy books you can do so, but before that you may try to research online on options trading.